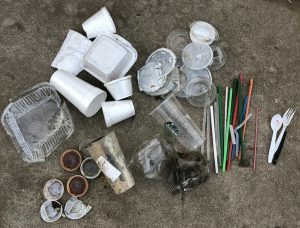 Single-use plastics collected at Surfrider beach cleanup at C Street on 7/20/18. 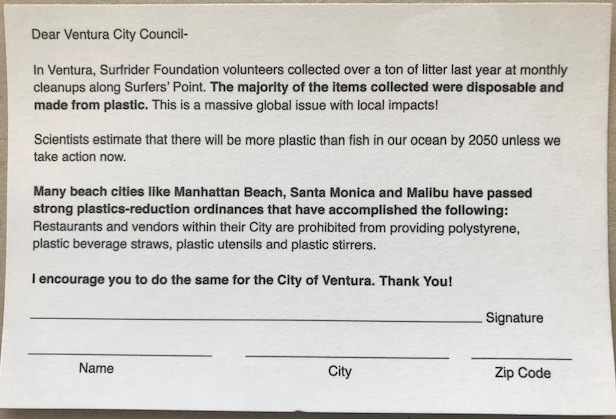 Surfrider Ventura’s “Plastic Free Ventura” campaign launched on Earth Day in 2018 as a response to the amount of single-use plastic litter that volunteers are collecting at local beach cleanups. Some of the common items collected include straws, expanded polystyrene foam (TM “Styrofoam”), plastic and bioplastic cups and utensils. Scientists estimate that by 2050 there will be more plastic than fish in the ocean by volume – unless we act now! Plastics and bioplastics are not marine biodegradable, but instead, photodegrades into smaller pieces of plastic causing pollution that is virtually impossible to remediate. When plastic enters our waterways, it adsorbs toxic chemicals such as DDT, PCBs, PAHs, and flame retardants that can be found in our waterways. California AB 1884, which went into effect on January 1, 2019, requires that plastic straws at full service dine in restaurants are only provided upon request. 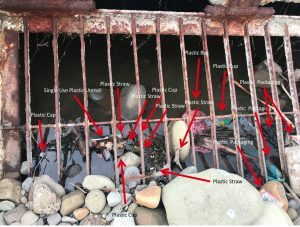 The Environmental Health Department of the Ventura County Resource Management Association is responsible for enforcing this statewide plastic straw law throughout Ventura County. There is a notification form for non-compliance on their webpage here. While this is a step in the right direction, most plastic straws we find at beach cleanups come from take-out establishments. 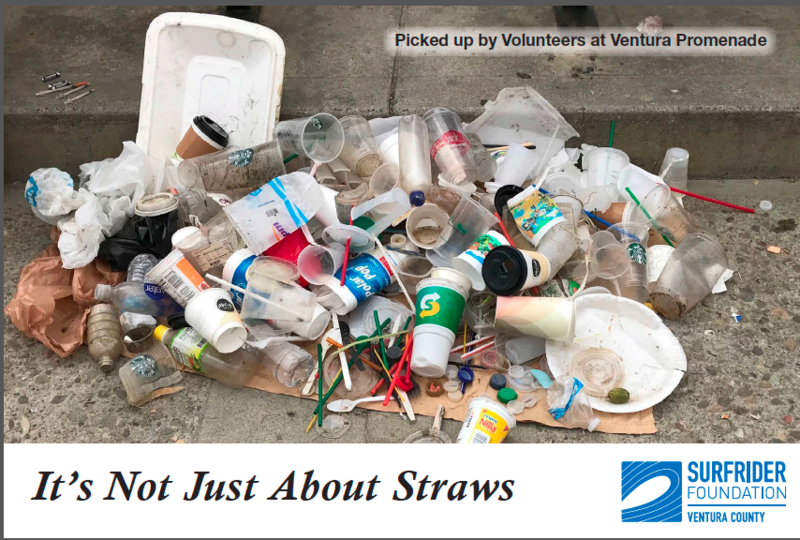 Join us in urging Ventura City Council to pass a more comprehensive plastics reduction law including a ban on plastic straws at all food and beverage establishments in the City of Ventura while offering alternative straws upon request. There are over 120 places in California that have local legislation aimed at reducing plastic litter and Ventura should be next! A copy of our proposed ordinance will be made available on this website later in the year. This photo of the drain at the end of Figueroa St. in Ventura is located on the beach and drains directly into the ocean. This photo was taken earlier this year and exemplifies the need to act now on this issue. 1. Getting our Plastic Free Ventura postcards signed! We are aiming to present 10,000 signed postcards to Ventura City Council. Email us to learn how you can help us achieve this goal. 3. Volunteer at our monthly beach cleanups at Surfers’ Point. Click Here for more info. 6. There are numerous companies that manufacture products that degrade naturally and are recyclable that can replace the items we are seeking to ban. Here is link to the City of Malibu’s plastic free guidelines and examples of compliant foodware. 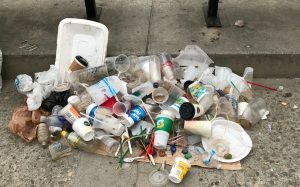 Manhattan Beach has also begun to ban plastics and has provided their guidelines. 7. Latest news on the negative impact of EPS and Plastics on our environment and us.